The adrenal glands are paired endocrine glands found on top of the kidneys. They are composed of an inner medulla and an outer cortex, which is in turn divided into three zones. The zona glomerulosa is the outermost layer of the adrenal cortex, and is responsible for secreting the mineralocorticoid hormones which are important in regulating fluid balance. Further information on the anatomy of the adrenal glands can be found here. In this article we will discuss the structure of the zona glomerulosa, as well as the functions of the hormones it produces. The zona glomerulosa is the outermost layer of the adrenal cortex, lying just below the fibrous adrenal capsule. It accounts for around 15% of the thickness of the cortex. The secretory cells of the zona glomerulosa are arranged in oval-shaped clusters – its name comes from the latin word glomus, meaning ball. 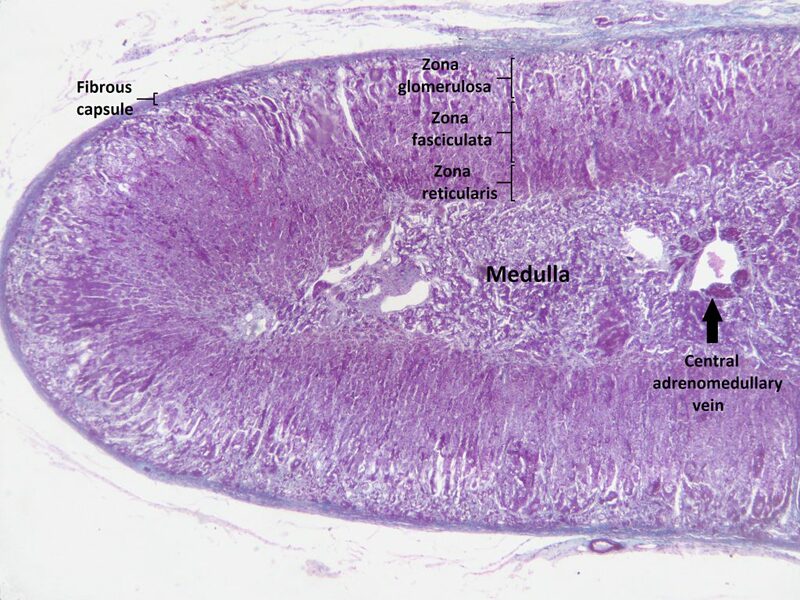 These clusters are divided by connective tissue bands called trabeculae which extend down into the cortex from the adrenal capsule. The blood supply to the secretory cells travels within these trabeculae. The primary function of the zona glomerulosa is the synthesis of mineralocorticoid hormones, which play an important role in the maintenance of electrolyte and water balance in the body. Mineralocorticoids are steroid hormones, and so are synthesised from cholesterol. 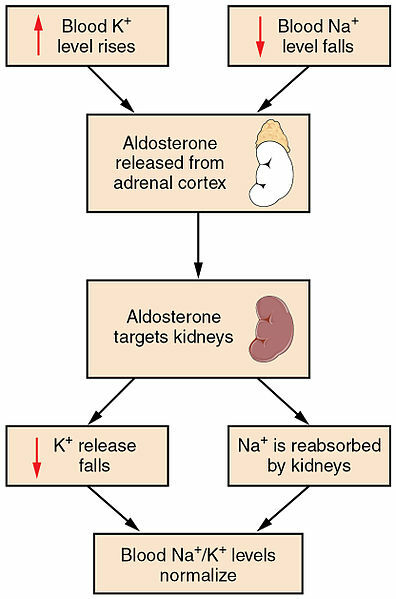 The most important mineralocorticoid is aldosterone, which is responsible for controlling the uptake of Na+ and secretion of K+ in the collecting duct of the renal tubule. Aldosterone acts within the tubule cell to increase the transcription of Na+/K+-ATPase and ENaC (epithelial sodium channels), promoting re-absorption of Na+ and excretion of K+. Fig 2 – Diagram showing the chemical structure of aldosterone. It is also worth noting that aldosterone secretion follows a diurnal rhythm, with higher levels typically being released during sleep. Whilst all the above factors are important in the production and secretion of aldosterone, one of the most important is the plasma concentration of Angiotensin-II. The release of aldosterone is therefore an important part of the renin-angiotensin-aldosterone system (RAAS) which is fundamental in the long-term regulation of blood pressure. Further information on the RAAS can be found here. Fig 3 – Diagram showing an example of the regulation and action of aldosterone. Conn’s syndrome occurs when patients develop an adenoma (benign tumour) of the zona glomerulosa which secretes excess aldosterone, leading to primary hyperaldosteronism. This condition is usually asymptomatic, however some patients will experience muscle cramps, headaches and lethargy due to electrolyte disturbances. Most importantly, the increased reabsorption of sodium and water by the kidneys leads to hypertension, which increases the patient’s risk of diseases such as strokes and ischaemic heart disease. Conn’s syndrome is usually treated by surgical removal of the tumour. The patient may also be given spironolactone (an aldosterone antagonist) to reduce their blood pressure and relieve any symptoms prior to surgery. 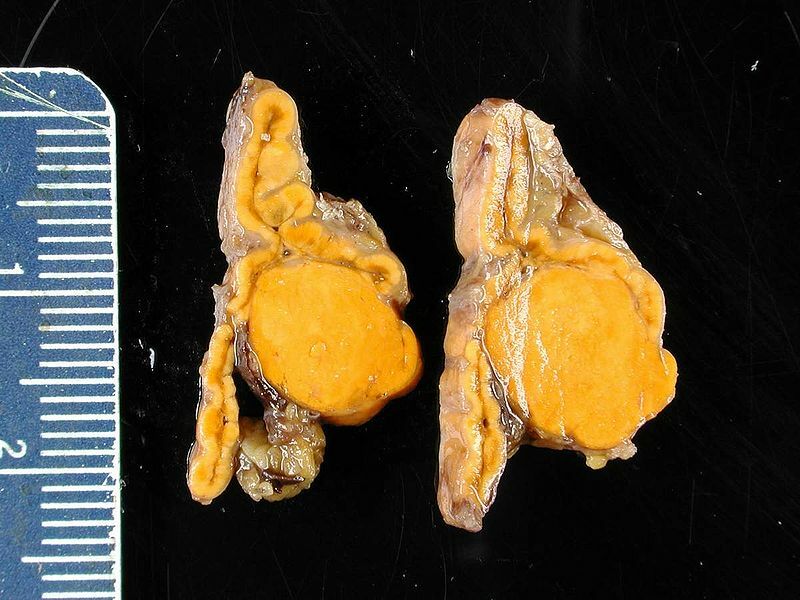 Fig 4 – Two sections of an adrenal gland from a patient with an adrenal adenoma. How much of the cortex is made up by the Zona Glomerulosa? Which of the following best describes the primary function of the Zona Glomerulosa? Which of the following would produce an increase in the rate of aldosterone production?